The Village Museum of Cigánd revives the process of how the village became town in the 1920's. The Village Museum is the result of reconstruction. It was originally divided into a room, porch, chamber and was built in the 1900's. Because the yards were too small, the so-called long yards that connected many houses were formed in Cigánd. Our building was situated on one of these long yards. In Cigánd the North Hungarian houses were typical. In these houses the flat furnace located in the room served to heat the house until the 1890's. The smoke was driven out through a lame chimney. The chimney corner seat was also apt for cooking. At the beginning of the 19th century, the so called 'patics' wall was general, but the mud walls were built from later on in the century. The roof of the buildings were made of rafters and were most generally covered with reed. The top ornaments were typical of the villages. Chambers also belonged to the houses, however, there were long houses too with many rooms. In the long houses, many generations lived together. The barns were detached buildings in the yard but from the turn of the century they were built to the main building. The pole at the front was reconstructed based on an old photo and reed was placed on the roof again. The facade was covered with planks. A large community room was formed at the place of the old farm buildings. Four rooms can be visited at the Village Museum: two interiors, the clean room and the porch. 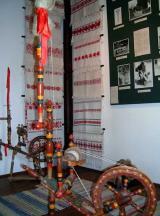 Textile and exhibition on local history is shown in them. From the middle of the 20th century significant changes took place in the interiors. The folk traditions show that he village Cigánd is located at the boarder of two regions. The old so-called 'kabolás' furnace and the lack of corner seats sign the north type. The appearance of kettle is typical of the Great Hungarian Plane's culture. That there were no barns for poultry in Cigánd was the effect of the Planes too. Their appearance showed the arrival of the northern culture. The building of the Village Museum was made up of three buildings and an attached one originally. The time of the building is signed by the fact that there is no trace of 'kabolás' furnace in it. Many reconstruction works were performed on the building in the 20th century. In the 20's the living room was changed into a clean room. The house was elongated with a barn. Thus, the chambers opposite to the house in the yard disappeared and they were replaced later. The fourth room of the Village Museum is the ward holding exhibition s about the past of the village, as well as famous people born in the village. We show the copy of the charter that first mentioned Cigánd, the tithe list from 1571 that first mentioned the list of the serfs who worked and lived in the village.